Sheep fat with extra vitamins and minerals. 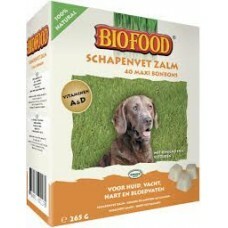 Especially suitable for dogs with food allergies. These sheep fat treats provide a beautiful shiny coat and a protective layer in the intestines for improvement of the digestion. Salmon oil, glucose, dextrose, whey, sheep fat, sunflower oil.